We are proud to support The Duke of Edinburgh’s Award to help ensure you are ready for the world of work. We believe The Duke of Edinburgh’s Award makes young people more employable and better prepares them for work. We believe the DofE develops young people’s leadership, problem-solving, self-management and teamworking skills – attributes essential to the future of UK business. We look favourably on young recruits with DofE Awards in our recruitment process. There are DofE Award holders across the Asda business in a huge range of exciting jobs. Asda have produced nine brilliant videos (which you can view here) to give you an idea of what the world of work is like, and how your DofE helps you prepare for it. You’ll find some really great inspiration and support on these videos, whatever direction you’re planning to take. Asda is one of Britain’s biggest and best-known retailers, serving more than 20 million customers every week! We all visit supermarkets, and think we understand them, but there is a lot more to a career in retail than meets the eye. Whether you are interested science, IT or the arts there is a career for you. 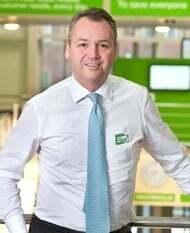 Here at Asda we are driven from the boardroom to the shop floor, to save our customers money and make their lives better by making things more affordable. Asda is also at the heart of the communities where we live and work, as well as being part of our global family Walmart, the largest retailer in the world. A career in retail is a fast paced, so much so, it is sometimes even called FMCG (Fast Moving Consumer Goods ) as a sector. This means it is vigorous, challenging and great fun! We live and breathe these beliefs day in and day out, which means Asda is a great place for you to bring all the skills you learn during your DofE in to the work place. If you join Asda, you’re not just starting a job, you’re beginning an adventure. I am a DofE Award holder myself - doing my Bronze and Silver Awards gave me focus and co-ordination skills. The expeditions and work in the community that I got involved in gave me the opportunity to learn about myself and gave me life experience and led me to reflect on the importance of working with people and respecting others. I feel fortunate to be leading a business that has a passion for developing people - if you want to succeed in retail, then having something extra – an extra piece of drive, the ability to make things happen, is something that will give you an edge and therefore the skills that you learn through your DofE are definitely something that will pay dividends for the future.